Version 1.0 of the Safe Digging - A Guide to PROPPER Ground Disturbance is now available. 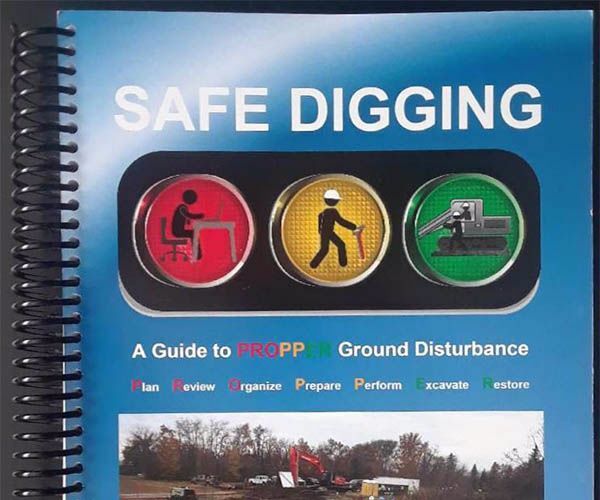 The content and organization of this manual closely follows Locate Management’s online Safe Digging - Supervisory Ground Disturbance course and can be used as a reference for the course. This manual is an important guide during the phases of an excavation or ground disturbance project. This manual is aimed at developing advanced safe digging skills and attitudes for all stakeholders (individuals and companies) in the ground disturbance and excavation communities. This manual provides the PROPPER processes to plan and safely perform a ground disturbance (excavation) as per applicable regulatory requirements and industry best practices and standards. This manual is not a definitive guide to government regulations nor is it a comprehensive guide to the practices and procedures wholly applicable to every ground disturbance or excavation. Appropriate regulations, company-specific work practices and manufacturers’ equipment instructions must be consulted and applied with due diligence. Despite a worker’s qualifications, training and experience, there are no guarantees that work will be performed safely. The manual is divided into 10 sections.